Charles trailed in last in heat 1. James didn't have enough speed in heat 2 and the spectators knew exactly what was going to happen. Seven shared heats followed. Both Kyle and James passed Jordan Stewart in heat 4, but Lasse slowed dramatically while leading on the last lap of heat 5. Todd passed Jonas on the inside entering lap 2 of heat 10 and although he had the whole track to ride on Jonas elected to go wide, found a lot of grip on the outside of the second bend and bailed out. Graham disagreed and discluded Todd! Kyle was the tactical substitute in heat 12 but after three laps following Dmitri and Lasse he was passed off the last bend by Jonas. Charles led heat 13 but Kyle was again last and unable to catch Ben and Thomas ahead. James led heat 14 until Jordan passed him on the inside entering the last lap. James was pushing and looking to regain the lead but clipped Jordan's back wheel and was thrown into the fence on the fourth turn. Thankfully he was able to walk back to the pits once he'd been extricated from under the air fence. 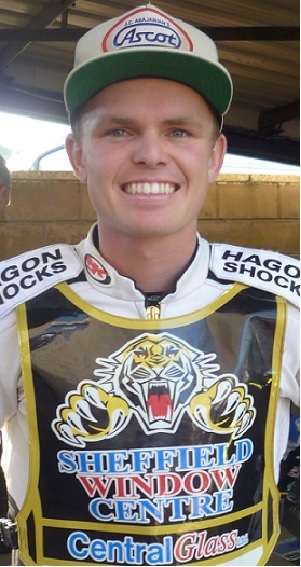 Charles had a four lap scrap with Ben Barker for a point in heat 15 while Kyle eventually made a decent gate and denied Dmitri the outside line and the Tigers record their first heat advantage of the night. Too late!